This year (2018), Jeep has rolled out a new design for their 2018 Jeep Wrangler & Wrangler Unlimited. If you’re like myself and many other Jeepers, you might be wondering exactly what kind of changes are to be expected. After doing a bit of research, I have composed my findings on what I feel are some of the more relevant changes to the 2018 Jeep Wrangler & Wrangler Unlimited. Let’s face it, when Jeep announces that it has a new generation of the Wrangler, it’s a pretty rare and momentous occasion. So if you are in the market for a new Wrangler, you will want to read this blog thoroughly. What kind of highlights can you expect? Well, the new-gen Jeep will include a better turning radius, stronger crawl ratio, a new turbocharged four-cylinder engine option, some modern interior upgrades, added technology for infotainment and safety, and upcoming diesel engine and hybrid-electric powertrain options. As old school as the Wrangler might be, being the “Jeep” most people refer to when they use the brand’s name, this newest edition marks only its fourth generation since its consumer market debut in the 1980s. Since then, design details have changed, but the overall appearance of the Wrangler hasn’t morphed too far from the original. Technology has improved the Wrangler’s capabilities and performance, but the tradition of being as rough-and-tumble as they come, and as iconic to off-roading as it can be, has remained intact. On the exterior, the new Wrangler retains the well-organized slotted grille and round headlamps that have defined this SUV since it first appeared as a military vehicle in the 1940s. Trapezoidal fenders and a short wheelbase on a square body also remain. The legendary capability to remove doors, lower the windshield, and remove the top are also part and parcel in the new-generation Wrangler. As are heavy bumpers, ready-for-action tires, and a tailgate-mounted full-sized spare tire. Is there any differences to the exterior of the new 2018 Jeep Wrangler? Yes. The dimensions of the new 2018 Wrangler JL are a bit larger than the outgoing Jeep, with an overall length of 166.8 inches (4,237 mm) for the two-door model, versus 164.3 inches for the previous gen. Width and height remain almost the same, at 73.8 inches (1,875 mm) and 73.6 inches (1,868.4 mm) respectively, compared to the 73.7 and 72.5 of the JK. The Wrangler’s wheelbase will extend in the new version by about an inch and a half at 96.8 inches (2,460 mm) from the current-gen’s 95.4 inches. Perspectively, the four-door models have a similar growth in size as well. 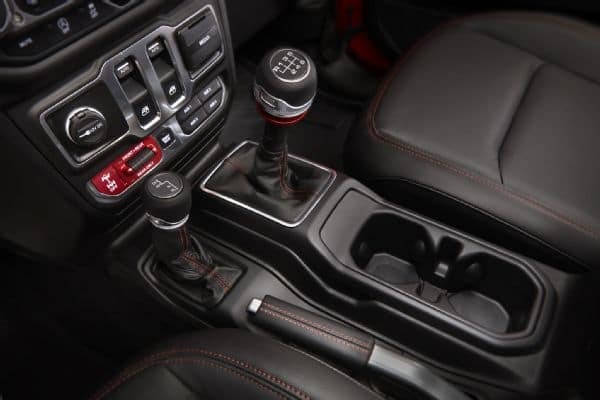 Also, the inside of the new 2018 Jeep Wrangler, we can see use of the newest-generation Uconnect infotainment, remedying a chief complaint many Jeepers have had with Wrangler models in the past. In addition to this update, Jeep has added creature comforts like a usable arm rest between the front seats, more head and leg room, and an easier-to-use soft top. The soft top now uses plastic rails that snap into place on the roll bars, eliminating the yoga-inspired engineering required for installation of the soft tops of old. The new roll cage’s profile and the soft top’s installation method mean less wind buffeting at speed, as stated by Jeep engineers. Jeep has also labeled hinges and release points for doors, windscreen, etc… with the tool required to remove them (tools come as standard equipment), simplifying the learning curve for first time Jeep owners. Jeep also says that it’s improved the all new 2018 Wrangler’s weight by using aluminum on the hood and doors, and magnesium alloy on the tailgate. However, these weight losses seem to be offset by other changes as the curb weight for the new-generation JL is a few hundred pounds heavier than the equivalent model in the outgoing JK. The 2017 Wrangler Sport weighs in at about 3,760 pounds (1,403 kg) whereas the new 2018 Wrangler Sport in its base configuration weighs about 3,955 pounds (1,794 kg). It’s the Rubicon model that seems to benefit the most from these weight-saving measures, having just a handful of pounds added (4,145 pounds for 2018 versus 4,129 pounds on the outgoing). Also heavily anticipated for the 2018 new-generation Wrangler are engine and powertrain options. Everything is improved here, starting from the base model V6 to a newly-added turbocharged four-cylinder. Jeep promises that a 3.0-liter diesel and a hybrid-electric option are also coming, but has not yet released specifications for those. Most assume that the hybrid won’t be around until 2019 while the diesel will be introduced sometime mid-year in 2018, having only recently received US government approval. 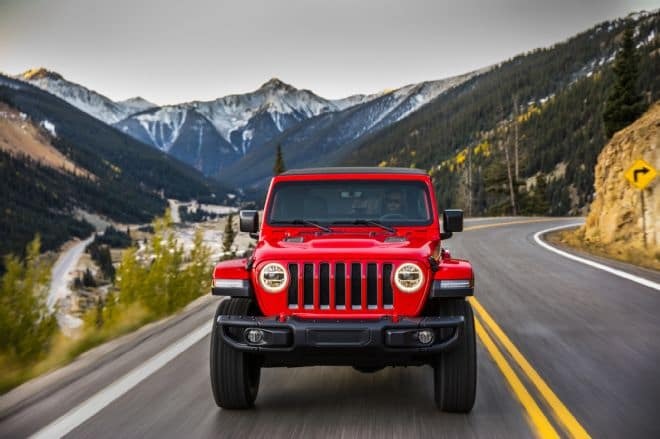 Furthermore, the 2018 Jeep Wrangler will continue with the 3.6-liter Pentastar V6 it’s been using for years, but that engine sees several upgrades commensurate with what it’s seen in other Fiat-Chrysler models it’s used in the past. For reference, engine displacement and outputs remain unchanged from 2017 at 285 horsepower and 260 pound-feet. The RPM peaks for those outputs also stay the same at 6,400 and 4,800 respectively. Also added for the 2018 Jeep Wrangler in the new JL platform is a 2.0-liter turbocharged four-cylinder. This engine outputs 270 horsepower and 295 lb-ft of torque. Though it does come with a lower RPM than the V6 (5,250/3,000). This means that the turbo-four will have about the same output as the V6, but deliver it faster and with better torque to boot. Off-roaders understand why that makes a big difference as torque is what it’s all about. Fuel efficiency numbers aren’t released yet, but this little engine has the same towing capacity, as does the V6, and will use the same transmissions. It’s a part of the same engine family developed by Ferrari for Alfa Romeo, and will be built in Chrysler’s Trenton, Michigan plant with overflow coming from Termoli, Italy. Moving forward, the chassis for the 2018 Wrangler remains body-on-frame, of course, but the front axle moves from a live axle to a solid axle configuration, keeping the sway-bar disconnect system as standard equipment for the Rubicon. Shock absorption depends upon the package and wheel size, but remains equivalent to what was offered in the outgoing 2017 Wrangler. Now, the previous information relates to the majority of Jeeps new 2018 models. However, we have not touched much on the new 2018 Jeep Wrangler Rubicon and it’s complete overhaul redesign. Particularly because the 2018 Jeep Wrangler Rubicon has so many new features we could overview that we will need to make a completely separate blog just for the 2018 Jeep Wrangler Rubicon. However, we did want to at least give you a glance of what the new 2018 Jeep Wrangler Rubicon will look like and what you can expect. If you would like to have an in-depth look at the 2018 Jeep Wrangler Rubicon, Four Wheeler Network has put together a great overview on the 2018 Jeep Wrangler Rubicon: “First Look: 2018 Jeep Wrangler Rubicon”. If you are curious for more information on the 2018 Jeep Wrangler Rubicon. Contact one of our product specialists today at Sorg Dodge. We would be happy to assist you with any questions you might have to the best of our ability. Till then, please stay tuned for our in-depth overview on the 2018 Jeep Wrangler Rubicon. All-in-all, Jeep has, yet again, outdone themselves with their new gen Jeep Wrangler for 2018. At Sorg Dodge, we already have some 2018 models. Stop in today to test drive one of our new 2018 Jeep Wranglers or Jeep Wrangler Unlimited models. Have immediate questions? Contact one of our product specialists today. Interested in test driving a new 2018 Jeep Wrangler/Wrangler Unlimited? Walk-ins are welcome or you can schedule an appointment today. If you aren’t sure if you would prefer a 2-door or a 4-door Wrangler, see our previous blog: “Wrangler or Wrangler Unlimited? It’s a Jeep thing.” for an in-depth review on both of the models. As well as, several sources for modifying your new Jeep to your own specifications. In need of service? Excellent. We have an amazing service team ready at your disposal. Contact service today to schedule an appointment. In conclusion, should you have any questions at all, please do not hesitate to reach out to us here at Sorg Dodge at your earliest convenience. We would be glad to assist you. Thank you in advance for reaching out to us here at Sorg Dodge. We look forward to hearing from you in the near future.